Pack Healthy Trail Meals | GetOut! 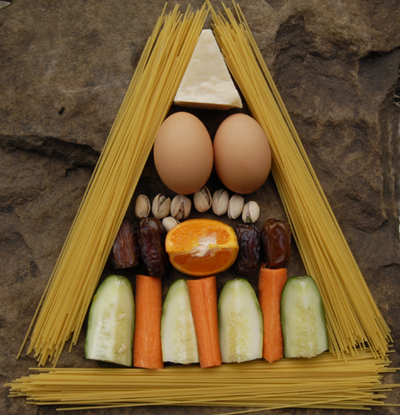 The Harvard School of Public Health has created an alternative to the USDA food pyramid. It’s pretty intuitive and sensible, check it out. As always, it’s recommended that you take a daily multivitamin. Vitamins, minerals, protein, carbs, fat – can you really get all the nutrition you need when packing your meals for an active weekend (or longer) outing? Yes, says Christine Gerbstadt, MD, RD, who is a spokesperson for the American Dietetic Association. “Don’t let these excursions be an excuse to get lazy and have a heyday free-for-all with the diet,” she says. “In fact, it should be a reason to eat healthier because you need to give your body the nutrients to be active.” Here’s how. Start with an intake. Christine suggests starting with a food recall – track the food you’ve eaten over the past few days to see what your starting point is. “Be honest, be objective, do an inventory, be aware of where the deficits are, be aware of where the surpluses are, and fine tune it in a reasonable way,” she says. In her experience, foods most commonly skimped on in the field include fruits and vegetables as well as dairy. Go to www.fitday.com or www.mypyramid.gov to do your intake; you’ll also get your suggested calories/day based on height, weight, age and activity level. Rely on the standbys. Fresh fruit is easy to bring on a day trip – you can throw an apple or orange in your bag. If you’re watching your weight – pack weight, that is – bring dried fruit. Carrots and cucumbers are easy veggies to pack and it’s getting easier to find dried vegetables at the store, too. Tuna comes in single-serving packs for your protein, and if you’re vegetarian (or not) try hard-boiled eggs. The most versatile option for dairy is powdered milk. Search out healthy prepared foods. If you’re more likely to eat vegetables when you can simply buy a bag of them prewashed and precut, go for it, Christine says. More and more energy bars are made from whole, raw ingredients too, like Larabar and KIND bars. Laughing Cow makes real cheese wedges that don’t have to be refrigerated before opening. Read the label on a dried soup mix for dinner to make sure it has a variety of vegetables and not too much sodium.